I just thought I'd start a thread about it to see if there's any other Ozbassers who like their rock/musician (ie. maybe jazz?) biographies and what books they have liked. 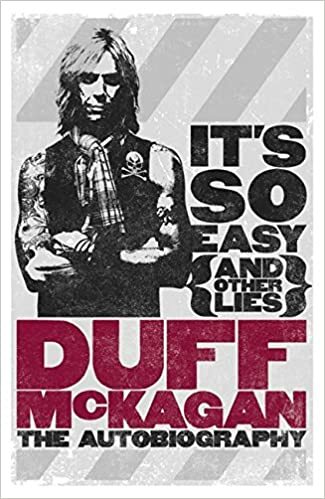 I'll kick off with Duff McKagen's autobiography "It's So Easy - And Other Lies". This guy should be dead. The way he went from the depths of drug and alcohol addiction to being completely clean and getting heavily into martial arts is inspirational. An awesome book. Highly recommended. A founding member of Guns N’ Roses and Velvet Revolver—and Rock & Roll Hall of Fame inductee—shares the story of his rise to the pinnacle of fame and fortune, his struggles with alcoholism and drug addiction, his personal crash and burn, and his phoenix-like transformation. In 1984, at the age of twenty, Duff McKagan left his native Seattle—partly to pursue music but mainly to get away from a host of heroin overdoses then decimating his closest group of friends in the local punk scene. In L.A. only a few weeks and still living in his car, he answered a want ad for a bass player placed by someone who identified himself only as “Slash.” Soon after, the most dangerous band in the world was born. Guns N’ Roses went on to sell more than 100 million albums worldwide. I have read a few. I found The Church one interesting. I guess because I used see them around the pubs a fair bit. The Chrissy Amphlett one (Pleasure and Pain) was good. I really enjoyed I Am Ozzy and Tony Iommi- Iron Man. The Keith Richards one was a good read too. I thought Starman was pretty good as well. Read a couple of Led Zep and Hendrix books a while back as well, some are better than others IMO. Yeah, I liked the Church one too Russ, though it did seem a bit rushed at the end to me. Sammy Hagar. I can't look at the Van Halen brothers the same after that. I'm not a book reader, but I read it in under 3 days. Billy Thorpe's book is supposed to be really good too. Sorry, haven't read it. BassLine wrote: Billy Thorpe's book is supposed to be really good too. Sorry, haven't read it. Yes, I forgot I had read it. Horace Panter, "Ska'd for Life"
Guy Pratt "My Bass and Other Animals"
Those three cover an amazingly varied set of experiences, now that I think of it. I do love books and biographies; especially coffee table books on bands and rock musician bios. Shakey (Neil Young) - is great. I loved this biography too! I must admit to being very surprised at how articulate Duff is. Very well spoken and intelligent. I was expecting drug fuelled rantings but it was just the opposite. John Lydon's 'Anger is an energy'. Funny, thoughful and intelligent guy. Stewart Copeland (Police) 'Strange things happen' is very good. Not much on the original days of the Police, although quite a bit about the reunion tour. I'm going to re-read Chrissy Amphlett's one soon. I really liked the way she had side bars, with other guys in and around the band sharing their side of the story. Joe Jackson's 'A cure for gravity' is one of my favourites. He tells his story up to getting his record deal. Lots of stories of bad gigs in worse venues. Elvis Costello's 'Unfaithful music and disappearing ink' is very good. Bob Dylan's "Chronicles volume 1" is really well written. I hope he does volume 2. I was a little disappointed with Pete Townshend's one. Not bad, just expected it to be better. I've read heaps of them, I'll try and remember the better ones. Billy Thorpe too. He kept dropping the C word in songs and getting arrested in Melbourne. One judge told him, "you can't go around singing "C&%$". So he wrote a song called "you can't go around singing C^%$" and opened with it, got arrested, and told the judge, "but it's the name of a song". The judge agreed and let him off. Keith's Life was a great read, surprised he remembers anything at all. Ozzy's book was okay - I got the vibe he was being completely honest, and a giant tool. The Motley Crue one was absolutely hilarious, def's worth a read. Red Hot Chili Peppers book was very well done, but sad.